Drive unit : D. C. motor 1/2 H.P. 1500 RPM 220 V.D.C. 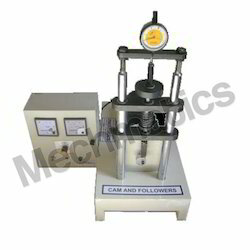 We are offering Cam Analysis Apparatus to our clients. Drive Unit: D. C. motor 1/2 H.P. 1500 RPM 220 V.D.C. Cams: Tangent, Eccentric, Circular Arc, made of hardened alloy - steel. Followers: Roller, Knife edge, Mushroom, made of hardened alloy - steel. - Drive: D.C.-0.25 HP 0-1500 RPM. The follower is properly guided in gunmetal bushes and the type of follower can be changed according to the cam under test. - Cams: Tangent, Eccentric, Circular Arc, made of hardened alloy – steel. - Followers: Roller, Knife edge, Mushroom, made of hardened alloy – steel. The consists of a cam profile and study of cam follower system. 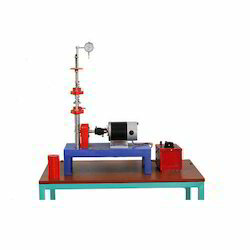 The instrument consists of cam mounted shaft supported by ball bearing upon which three different type of cam can be mounted. The push rod for follower is supported vertically which can adopt three different type of followers can be changed easily.